Prominent & Leading Manufacturer from Mumbai, we offer foam type extinguisher outside co2 type. 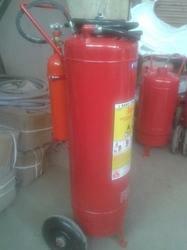 Mechanical Foam (AFFF) type Fire Extinguisher. Outside CO2. Trolley Mounted. IS 16018. Looking for Foam Fire Extinguisher ?